Collection of Caroline and Kevin Reagh. 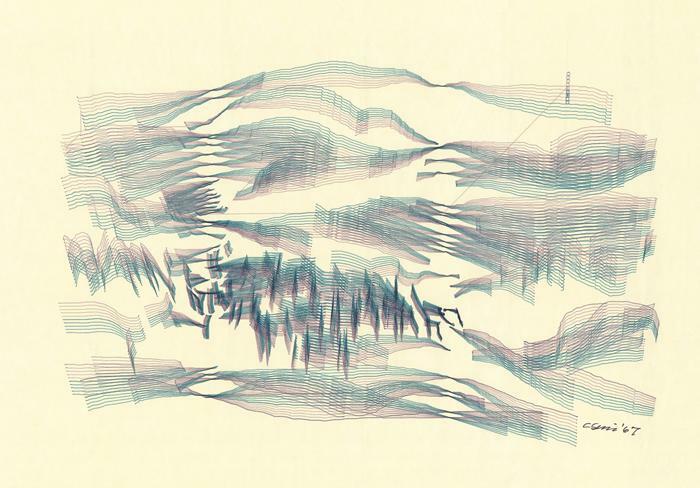 Sinescape resulted from Csuri’s application of the sine curve function to transform one of his landscape drawings. It is one of the few early works that includes color, which the artist obtained by simply changing the plotter pen from black to red. Csuri’s shift from oil paintings to plotter drawings was dramatic in large part because a drum plotter did not offer Csuri the vibrancy of oil paints. However, the artist continued to think and to imagine in color, as demonstrated by his sketchbook drawings from 1965-66 and the color-related programming tools he collaborated to create from the late 1980s to the middle 1990s.